After four weeks of build-up, soul searching and discussion, it’s finally time for things to end. Magneto, Magik and Danger are determined to break Scott Summers out of prison and it doesn’t seem like there’s going to be a peaceful alternative to this situation. With the Avengers otherwise busy, apparently searching for Hope (who’s on a mission to find Cable), things escalate quickly over at the prison. But is this new group of mutants a threat to society or a team dedicated to helping mutants no matter the cost? That question is up to the reader to decide. Since the beginning I’ve been a fan of this series. Kieron Gillen understood how to take a large roster of characters who had just been put through Hell and turn it into a cohesive and entertaining story. Whether it’s traversing the globe with different characters getting a sense of their mental state, a daughter’s search for her father, or a mutant leader dealing with the fallout of a war that he lost, you care about everyone in this story. Even if you only skimmed Avengers vs X-Men, or at least have an idea of what happened, you can find a lot of enjoyment in this title. Seeing Scott transform from a pouting egotist to a mutant revolutionary is a journey I enjoyed seeing play out. You get glimpses of a Cyclops long gone but you also get a glimpse at the Cyclops to come. We didn’t get complete closure and some elements are sure to be explored in future stories, but what Gillen created was a story that people should read, and the ending really leaves me hopeful for Marvel NOW! Handling art duties for the final issue is Gabriel Hernandez Walta. It’s immediately apparent how different this issue’s art is from all the other issues. The first four were very line-heavy and ranged from stylistic realism to uncanny realism. What Walta brings to the table is a very cheery, almost watercolor painted style with vivid expressions and imagery. It can be slightly jarring at first, especially if you read the whole series in one sitting, but it works impeccably with the direction of this issue. A number of scenes are without text and rely on Walta’s pictures to convey a message. 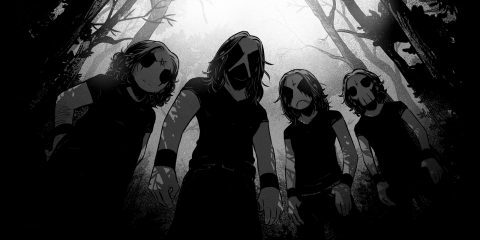 Sometimes it’s used for comic effect, sometimes it’s used to drive home an emotional point, either way Walta delivers and it greatly increases this issue’s appeal. The only odd thing, and this is really a small quip, is Captain Marvel. She’s seen in a couple panels with the Avengers and in them she looks slightly off, especially if you’ve been reading Kelly Sue DeConnick’s run with her. It’s not a major deal, just something worth pointing out. 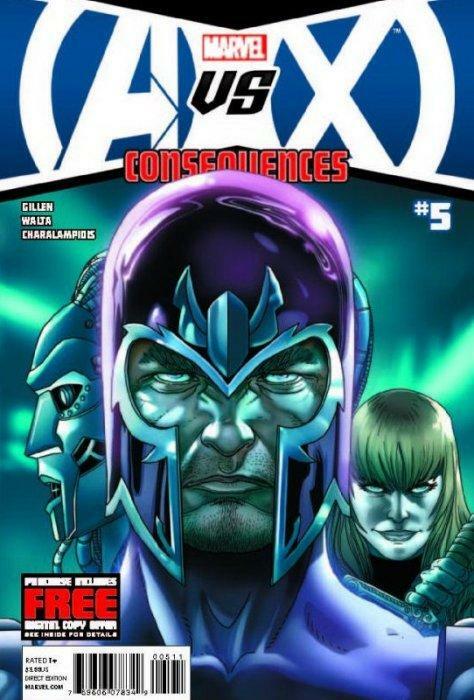 Avengers vs X-Men: Consequences is a great five-issue limited series that delivers on all fronts. It may not answer every question coming out of the event, and the rotating artists might confuse some reading in trade, but Kieron Gillen has written a great story and I’m excited to see how all of these characters stories turn out. Definitely worth buying.